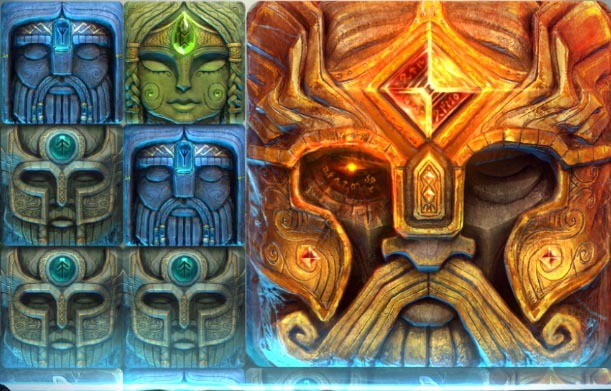 NetEnt’s Asgardian Stones online slot leaps into the popular world of Norse mythology, with the sort of twists and touched you would expect from the Swedish gaming giant. Take on this five reel, 20 payline epic adventure that pits mere mortals against the might of Scandinavia’s most imposing gods. Featuring the brand new Colossal Crush feature, this new online slot cements NetEnt’s innovative reputation. The firm is also known for advanced systems such as Cluster Pays and Spiral Reels. If you fancy channeling your inner Thor, then stick your horned helmet on and visit Go Wild Casino. But is Asgardian Stones all it is cracked up to be? SpinCazino takes a look at this NetEnt online slot. Asgardian Stones sits across five reels and three rows, with 20 paylines available. It looks stunning, as you would expect from NetEnt. The reels are set in stone, standing in the way between you living in the mortal realm and entering the land of the gods. Can you sail through to the promised land, or will the stones repel you? In Norse mythology, Asgard is the home of one tribe of gods and ruled by Odin. It contains the region of Valhalla, and this online slot certainly manages to create a fitting atmosphere. The visuals are moody and dramatic, the soundtrack pulses in the background and the graphics are spot on. The excitement of spinning the reels is mixed with the tension at taking on the gods, making this a truly immersive experience. You can play coins worth between £0.01 and £1, with a minimum of one per line and a maximum of ten. There’s the chance to win up to 500 x your stake, which is not massive, but certainly a decent return. Find out more about slots at the How to Play Slots Games page. There is also a whole stack of great features to enjoy whilst on your quest. The Avalanche feature is NetEnt’s version of Cascading Reels. Essentially, the reels land after a spin. If there is a winning line, those symbols disappear and those above drop down, with new symbols filling the gaps at the top. This means that you can create new winning lines without even spinning again. The lines keep disappearing and refilling until there are no winning lines. You might have also seen this feature in other classic NetEnt slots such as Gonzo’s Quest. The Colossal Crush makes its first appearance in the Asgardian Stones slot, which is fitting considering you take on the mighty gods. You can land colossal versions of all the symbols except the Wild. They take the space of 2×2 or even 3×3 symbols and make it easier to land winning lines. Not only does a colossal symbol create more winning options on its own, but it also can crush rows below it. If there is a space from a win, the colossal symbol drops and for each row it destroys, the win multiplier increases. Your maximum multiplier in this feature is a cool 4x, meaning this innovative NetEnt feature could see you banking some sweet amounts. Your multiplier shows up on the stones to the left of the reels. Colossal Crush can take place in both the regular game and the Bonus Wheel feature. The Bonus Wheel is also handy for boosting your bankroll. The symbol that triggers the round is 3×3 and lands on the last three reels. When is does, it either brings a prize of up to 5x your stake or some decent free spins. You can retrigger this feature up to three times, earning up to a maximum 25 free spins in one go. The best bit is that even the Wild can turn colossal during the bonus round, creating even more potential wins. Should I Play Asgardian Stones? Asgardian Stones was always going to be a winner. NetEnt rarely puts a foot wrong and Norse mythology slots games tend to go down well. The Swedish firm has made something that looks and feels just right. It’s just the right mixture of fun and spine tingling to keep slots fans happy. It’s worth playing if only to try out the new Colossal Crush feature, but there’s so much more. This is a feature laden game that has something for everyone and a number of ways to win big. You can play Asgardian Stones right now at Casumo. NetEnt has been making online slots games since 1996 and is one of the biggest casino software developers around. It is known for its innovation and spectacular design. The company puts a great deal of thought into ensuring its games work on mobile first, a reflection of the way most slots game fans consume their favourite casino products. Popular slots titles from NetEnt include Gonzo’s Quest, Starburst and The Invisible Man. It also produces a host of table and live casino games. Some of its best known slots features are Cluster Pays and NetEnt Touch. Find out more about NetEnt on the dedicated page.